Ben Browder portrays Commander John Crichton, a 20th century American astronaut caught in a space accident that hurls him across many galaxies to the adventure of a lifetime, in the SCI FI original series, Farscape. 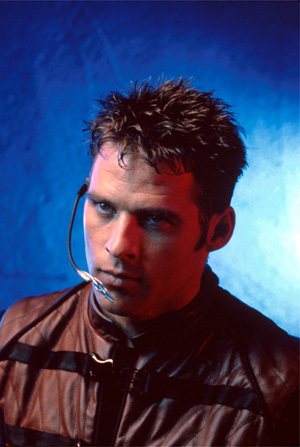 After five auditions and two months, Ben won the role of John Crichton. Browder considers himself an SF aficionado. He reads a lot of SF, and grew up on SF television and movies. Born in Memphis, Tennessee and raised in Charlotte, North Carolina--where his family owns and operates a NASCAR Busch series race car--Browder attended Furman University in Greenville, South Carolina where he graduated with a degree in psychology. He then started acting in regional theater. He later went to England and trained at the Central School of Speech and Drama. Browder is a relative newcomer. He is most familiar to audiences for his stint as Neve Campbell's beau Sam Brody on Party of Five. In addition, he has appeared in several TV movies that include Paper Mansions: The Dottie West Story starring Michelle Lee, Danielle Steel's Secrets starring Christopher Plummer and Josie Bissett, Innocent Victims with Rick Schroeder, and A Wing and A Prayer with Patty Duke. His serial TV credits include guest starring roles in Melrose Place, Grace Under Fire, Murder She Wrote and Boys of Twilight with Wilford Brimley. Browder made his feature film debut in Memphis Belle. He also appeared in Nevada with Gabrielle Anwar and Kirstie Alley, A Kiss Before Dying with Matt Dillon, and the independent feature Boogie Boy, directed by Craig Hamann. Browder appeared in the Broadway production of The Merchant of Venice starring Dustin Hoffman as well as regional theatre productions.